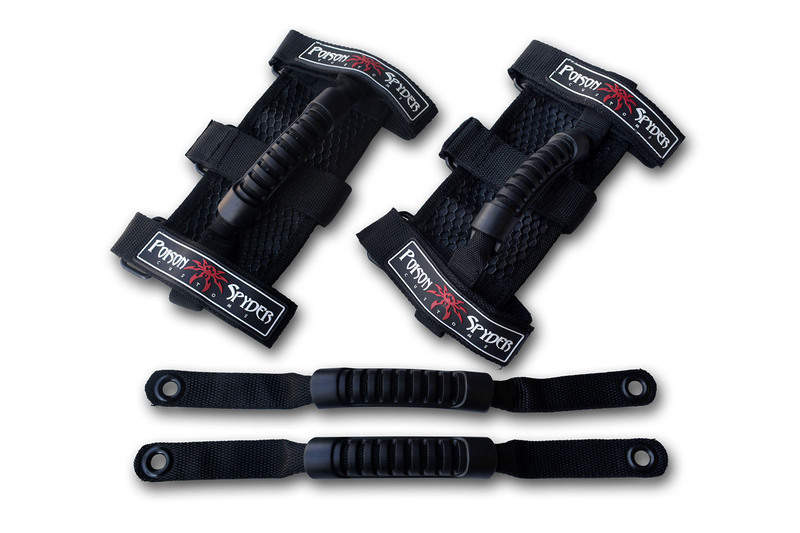 Poison Spyder JK 4-Dr Front and Rear Cage Grab Handles(Set of 4). This set includes four grab handles to Fully outfit your Jeep Wrangler JK Unlimited with sturdy, durable entry grab handles for all four seats. Included are two Poison Spyder Universal Grab Handles, which easily mount to the factory header bars or aftermarket cages to provide a safe grab handle for each of the front seats. Also included are a pair of JK Rear Bolt-In Grab Handles, which attach via the existing sound pod fasteners at each of the rear door openings. All components are made of high quality nylon webbing with sturdy injection-molded handles. Proudly Made in the U.S.A.